I’ve been working on Home of a Needleworker this weekend and finally finished the house. It’s been a long and I have to be honest here, boring stitch. It looks marvelous though and I do love it. I’m just glad it is over and I can get back to more interesting stitching – the alphabets and flowers that are left look much more fun! Joel is on holiday this week and we have some fun plans: visiting Perth Zoo (we love it there), going around some kitchen showrooms and just generally hanging out together. He is also looking forward to some quality time playing with his computer (he has his own programming projects that he likes to work on outside of work) and working on his drawing. Yesterday we went into “The City” and did our favourite Sunday afternoon activities, lunch at one of the food-halls, browsing JB’s for DVDs then hitting Borders for some reading material and home via David Jones for some tasty cakes from the food-hall. While at Borders I picked up the new Cross-Stitch and Needlework which had the lovely pillow that Monique had shown on her blog not so long ago, which was a surprise as I had actually picked it up for the Sweetheart Tree design on the front but it was a very happy coincidence. I am no longer a subscriber to this mag (I did collect it for many years) but I may have to start again if the next one I get was a good as this issue. I also grabbed Killer pancake by Diane Mott Davidson and A murderous yarn by Monica Ferris. They both look like fun, undemanding reads. Well, it is time for me to get ready for another day of stitching – this time I’m off to my dear friend Janine’s house for a get-together. It should be a fun day. Oh…your HofaNW is just looking spectacular…your nearly finished!!! Sounds like you had a wonderful weekend. 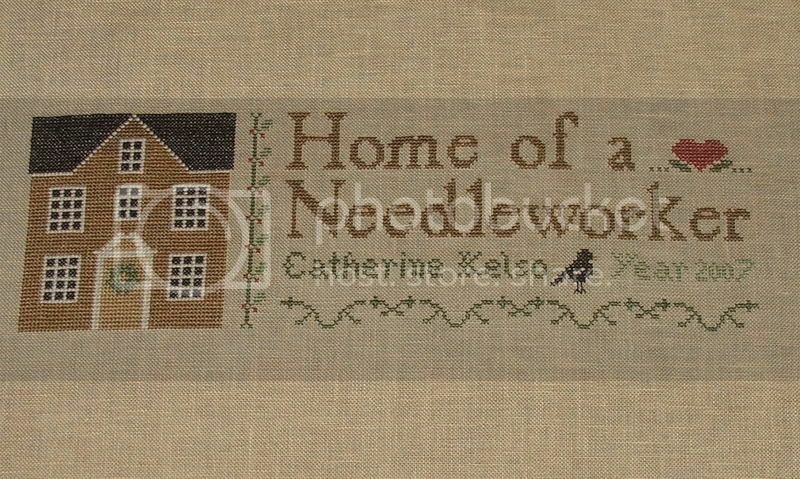 Home of a Needleworker is coming along beautifully. Congratulations on finishing the house, it looks beautiful. It’s the designs with huge chunks of one colour stitching that makes me avoid those Hawks Run designs from CHS. All that repeatitive stitching would have have the project quickly end up as a UFO! Trip to Spotlight today - thread for my new prize.